Time for a change. I mean that literally, in the sense that this week I am not recommending another literacy-related book and I also mean that in the sense that the demographics of the students attending U.S. public schools is changing. This past school year was the first time that students from racial and ethnic minority groups outnumbered white students, according to the U.S. Department of Education. While some of this change is due to immigration, a report by the Pew Research Center cited in The Washington Post states that it is driven more by an increase in the birth rate in minority families. What this means for schools is that they are increasingly diverse in their population. A huge increase has come in the number of English Language Learners enrolling in public schools. 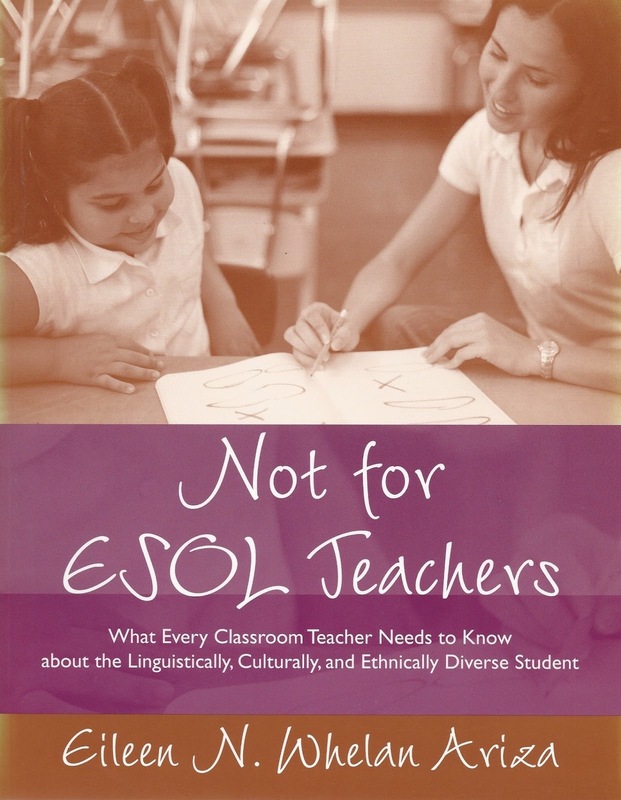 One book that can help educators better understand the needs of linguistically and culturally diverse students is Not for ESOL Teachers: What Every Teacher Needs to Know about the Linguistically, Culturally, and Ethnically Diverse Student, 2nd edition, by Eileen N. Whelan Ariza. There are six sections in the book. Part One provides background information about the range of diversity among students in contemporary classrooms. Through short descriptions of a multitude of teaching and learning situations followed by analysis, the author reveals the kinds of experiences that can occur more and more often in American schools today. She then discusses what ethnocentricity, cultural diversity, and diverse learning styles mean in the context of the public schools. These are very helpful chapters for teachers who do not possess an anthropology background. At the end of every chapter is a set of questions for discussion and/or tasks to do to reinforce the chapter ideas. Part Two discusses 5 groups of students: Native Americans, Asian Americans, Muslims, Haitians, and Hispanic or Latino students. The focus here is on their traditional beliefs and how to communicate effectively with people belonging to these ethnic groups. Part Three provides a short introduction to second language acquisition. After offering a rationale for why integrating language and content into classroom instruction is important (and referring to the Sheltered Instruction Observation Protocol, which will be the basis for an upcoming blog post), Part Four gets to what I consider one of the most pressing questions in public education today: How to teach academic content to ELLs. Not for ESOL Teachers does not go into great detail—there are loads of other books that do and do it well—but this book offers general suggestions that are commonly recommended to mainstream teachers. Supplemented with more stories from classrooms, the author explains how these techniques will benefit ELLs. Another chapter deals with teaching literacy to young learners and the last chapter in this section talks about teaching math. There is also a section describing several strategies that are helpful when working with ELLs. Not For ESOL Teachers closes with sections on assessment and working with other people who have responsibility for ELLs. The assessment chapter is very brief and just discusses why some test questions are culturally difficult for ELLs and offers some ideas for creating authentic assessments. There is a chapter on working with parents that explains why many are hesitant to get involved with their children’s schools and what teachers can do to make them feel welcome. The final chapter includes a five-page list of suggestions on how other school personnel can support ELLs. There are several appendices and an extensive bibliography at the end of the book. Not for ESOL Teachers is a broad overview of issues involved in the teaching of English Language Learners. It is by no means comprehensive but that is not its purpose. It is an easy read, which makes the concepts presented in this 203-page book more palatable and easily digested. Any teacher looking for a good foundation in what is involved in teaching ELLs would do well to read this book. You can read my other reviews of books that are useful for educators working with ELLs here, here, here, and here.